Dr. Benzinger is currently a fourth-year Radiology Resident at the Mallinckrodt Institute of Radiology, Washington University School of Medicine, St. Louis, MO. She earned a bachelor's degree from Williams College and her MD and PhD degrees from the University of Chicago-Pritzker School of Medicine, Chicago, IL. After completing her residency, she will begin a Neuroradiology Fellowship at the Mallinckrodt Institute of Radiology. Alzheimer's disease (AD) is an irreversible dementia of the elderly that has an insidious onset but eventually leads to severe debilitation and death. It currently affects more than 4 million people in the United States, and it is estimated that 14 million Americans will be afflicted by the year 2050. 1,2 Given the aging population in the United States, the National Institutes of Health have designated research in AD to be an urgent priority. 1 As new therapies for early intervention in AD become available, such as the vaccine trials currently under way, 3 the need for accurate, early diagnostic tools and the ability to assess response to therapy will become imperative. Radiologic imaging potentially holds the key to providing accurate, early diagnosis of this devastating disease. An overview of current routine, specialized, and research protocols for the imaging of AD is provided in Table 1. Most MRI protocols for initial evaluation of dementia also include diffusion-weighted imaging (DWI) sequences. There are no findings specific for AD on conventional DWI. However, DWI is helpful in the evaluation of stroke as a cause of the patient's dementia and to establish its chronicity. DWI is also helpful in exclusion of rare causes of dementia such as Cruetzfeldt-Jakob disease (CJD), a prion disease. In CJD, patients may present with increased signal on DWI in the basal ganglia and thalami (Figure 1). 6-9 Conventional CT and MRI, even with the inclusion of DWI, currently offer little information specific to diagnosing AD, nor do they offer any prognostic information. Similarly, perfusion MR can be used to show areas of decreased cerebral blood flow and cerebral blood volume. Compared with SPECT, perfusion MR allows superior spatial resolution for distinguishing between multi-infarct dementia, which has multifocal, subcortical decreases in cerebral blood flow, and AD, which has generalized cortical decreases in cerebral blood flow. 11 Perfusion MR has been found to show localized findings of decreased cerebral blood volume in the temporoparietal lobes with 90% sensitivity and 87% specificity in patients who have AD. 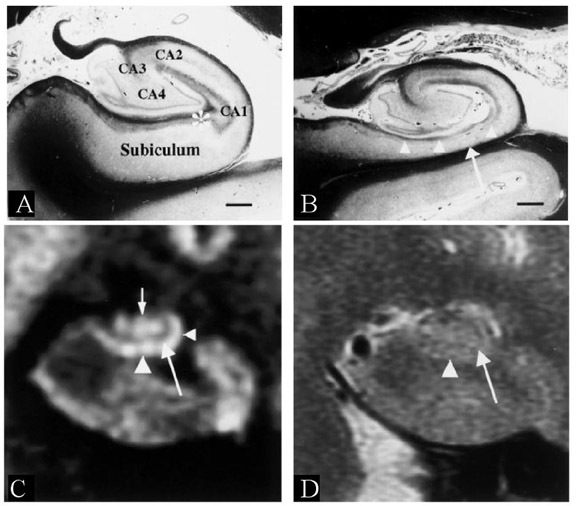 12 More recent research using a transgenic mouse model of AD suggests that regional decreases in cerebral blood volume in the hippocampus, thalamus, and temporoparietal cortex may occur prior to the development of any neurological dysfunction or histopathologic evidence of AD. 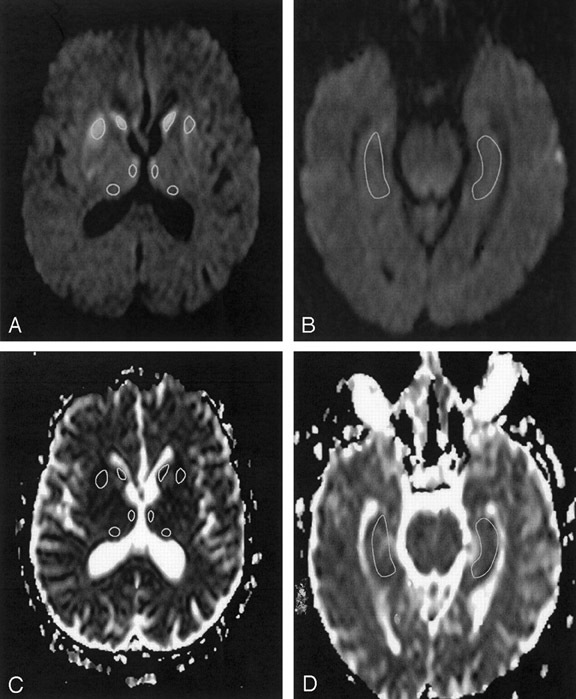 13 However, like PET and SPECT, the clinical utility of perfusion MR in the diagnosis of AD is still undergoing evaluation and is currently limited to special cases. The addition of DWI to clinical MRI has transformed the clinical evaluation of stroke, of which multi-infarct dementia is a part. The role of DWI in stroke is beyond the scope of this paper and has been extensively reviewed elsewhere. 28,29 In the case of AD, DWI allows for improved MR contrast within the hippocampus (Figure 2). White matter damage can also be assessed in AD by the placement of regions-of-interest (ROIs) in specific areas of the brain. White matter values of ADC and FA in a small cohort of AD patients have been established by Bozzali and colleagues. 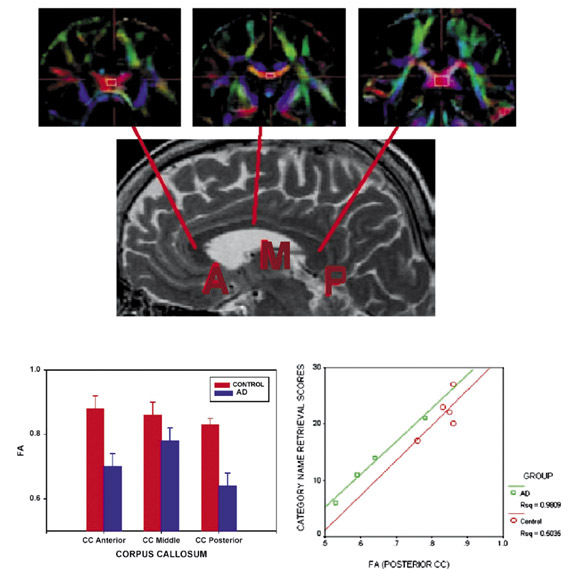 33,34 More recently, investigators at the University of Rochester used diffusion tensor MRI to evaluate the corpus callosum in AD and found a decrease in FA (Figure 6). Neuropsychological examinations of the same patients found a direct relationship between decreasing FA in the corpus callosum and cognitive decline. 35 A recent, larger study established values of ADC and FA for young adults, elderly adults without dementia, and AD patients. 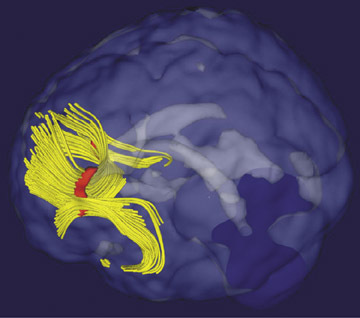 36 In this study, researchers at Washington University found decreased FA in anterior white matter structures for elderly patients without dementia but in both anterior and posterior structures for elderly patients with AD (Figure 7). The improved resolution and contrast of temporal lobe structures available with investigational diffusion MR sequences (Figure 2) also allows for quantitative diffusion tensor analysis of the hippocampus. In research presented at the 2004 meeting of the International Society for Magnetic Resonance in Medicine (ISMRM), Kantarci and colleagues 37 followed-up 89 elderly individuals over a mean time period of 40 months with serial high-resolution hippocampal MRI and clinical examinations. They showed that ADC abnormalities in the hippocampus can be used to predict later development of mild cognitive impairment and AD. Specifically, those patients with amnestic mild cognitive impairment and an elevated baseline hippocampal ADC were more likely to convert to AD during the time of the study protocol, and baseline hippocampal ADC predicted future progression to AD with 70% sensitivity and 75% specificity. Also at the 2004 ISMRM meeting, Samann and colleagues 38 presented a template-derived histogram approach to this hippocampal ADC analysis. Using this semiautomated approach, patients with early AD can be separated from age-matched controls. This method holds great potential for clinical utility, as it allows for the type of streamlined analysis necessary in reviewing clinical MRIs. Diffusion tensor MR also holds great potential in the diagnosis of Lewy body dementia. Like AD, Lewy body dementia is a fairly common form of dementia for which there are no specific imaging findings. It is very difficult to distinguish from AD by conventional imaging. SPECT studies of Lewy body dementia have found diffuse cortical hypoperfusion and hypometabolism involving the occipital lobe that is not present in AD patients. 39,40 Similarly, Bozzali and colleagues 41 recently used diffusion tensor MR to show abnormal diffusivity and FA in the occipital lobes of patients with Lewy body dementia, providing further evidence that this technique will be increasingly useful in distinguishing among various forms of dementia. Further investigation into the utility of MR volumetrics, MR spectroscopy (MRS), perfusion MR, and functional MRI (fMRI) is ongoing. In the area of volumetric analysis, clinical utility has been limited due to the overlap of normal aging and AD. Recently, however, it has been reported that in individual patients followed-up with serial MR examinations, the rate of atrophy directly correlates with the progression of disease. 48 This research has direct clinical applications, as whole-brain volumetric calculations can be easily applied to many of the clinical MR sequences currently in use. As patients return for MRI for other indications, a volumetric analysis could be added for those patients with suspected or diagnosed AD. Further research continues to establish parameters for volume loss in the hippocampus, the entorhinal cortex, and other temporal lobe structures. Alzheimer's disease presents a diagnostic and prognostic dilemma for which new imaging techniques will need to emerge as progress on treatments continues. Current guidelines from the neurologic literature recommend routine CT and MRI examination of all patients with newly diagnosed dementia. Although there are many imaging modalities for AD currently under investigation, MRI offers a single, noninvasive examination allowing for the measurement of changes in multiple parameters. These include relaxation, water diffusivity, volumetric analysis, brain perfusion, metabolic analysis, and functional imaging. Diffusion tensor MR is emerging as a sensitive and specific tool for identifying patients with early and late AD and as a method for evaluating disease progression-information that will be critical to referring physicians as new pharmaceuticals become available. Radiologic approach to Alzheimer&#39;s disease and other dementias: The emerging role of diffusion tensor magnetic resonance ima. Appl Radiol.